Russian businessman Dmitry Rybolovlev ranks in the top 200 wealthiest people in the world, according to Forbes Magazine. Since December 2011 he has been the Chairman of AS Monaco, regenerating the famous football club, and taking it from the bottom of the French Ligue 2 to the semi-finals of the Champions League and the French Ligue 1 Championship title in 2017. A man of many parts, he first trained to be an emergency cardiologist, then became an international businessman, spending eleven months as a prisoner in a Russian jail for a crime he did not commit, before going on to transform the fortunes of fertiliser giant Uralkali and listing the company on the London Stock Exchange. From Russia’s Urals Mountains to Monaco’s Stade Louis II, this biography traces the epic saga of this reserved, determined and enigmatic character. It dissects his extraordinary story and takes us backstage at this famous football club, where the transfers and negotiations take place. It transports us from Rybolovlev’s hometown of Perm in eastern Russia to the private Greek island of Skorpios once owned by Aristotle Onassis and now the retreat of Rybolovlev and his family. 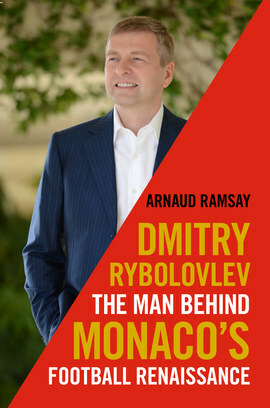 Based on dozens of interviews with sources from the businessman’s past and present, and with rare access to Dmitry Rybolovlev himself, this is the complete story.